Freedom and Flourishing: Why seek out the statue of Adam Smith when visiting Edinburgh? 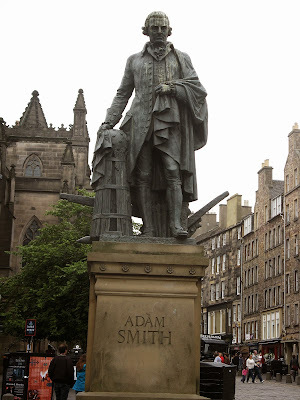 Why seek out the statue of Adam Smith when visiting Edinburgh? When I visited Britain in August I was pleased to see the image of Adam Smith on £20 notes. I was even more pleased to find a statue of Adam Smith in Edinburgh. The statue, by Andrew Stoddart, stands in the Royal Mile, in High Street, next to St Giles Cathedral and opposite Edinburgh's City Chambers. It is not difficult to find. Unfortunately, it seems that the birds are not treating Adam Smith with the respect he deserves, but I doubt that he would care. I went looking for Adam Smith because he is the father of modern economics and because his views on the benefits of specialization and free trade have contributed to a vast improvement in living standards over much of the world over the last couple of centuries. But I suppose that is the kind of thing that might be said by anyone who views himself as a disciple of Adam Smith. When asked to be more specific about Adam Smith’s contributions, people who are familiar with his writings tend to emphasize different things. One important contribution lies in fundamental thesis of Wealth of Nations that the extent to which people are able to enjoy ‘the necessaries and conveniences of life’ depends largely on labour productivity – ‘the productive powers of labour’. Economists debate whether Smith told the right story about productivity growth – perhaps he gave too much emphasis to capital accumulation, gains from specialization and scale economies, rather than to technological progress. I think the important point is that Smith understood and emphasized the importance of economic freedom in promoting productive use of resources (including good management) as well as an efficient allocation of resources among industries. ‘It is not from the benevolence of the butcher, the brewer, or the baker, that we can expect our dinner, but from their regard to their own interest’. ‘How selfish soever man may be supposed, there are evidently some principles in his nature which interest him in the fortune of others and render their happiness necessary to him though he derives nothing from it except the pleasure of seeing it’. Smith also made a major contribution in explaining that the visible hand of government is often far from benign. I particularly like a passage in The Theory of Moral Sentiments about the consequences of being governed by ‘the man of system’ – a political leader who is ‘apt to be very wise in his own conceit’. Smith suggests that the ‘man of system’ imagines that ‘he can arrange the different members of a great society with as much ease as the hand arranges the different pieces upon a chess board’. He fails to consider that ‘in the great chess board of human society, every single piece has a principle of motion of its own, altogether different from that which the legislature might chuse to impress upon it’. Smith points out that when the visible hand of government is attempting to regulate the individual members of society, it is likely that ‘the game will go on miserably, and the society must be at all times in the highest degree of disorder’. (See: TMS, VI.ii.2.17). ‘Every man, as long as he does not violate the laws of justice, is left perfectly free to pursue his own interest in his own way, and to bring forth both his industry and capital into competition with those of any other man, or order of men. The sovereign is completely discharged from a duty [for which] no human wisdom or knowledge could ever be sufficient; the duty of superintending the industry of private people, and of directing it towards the employments most suitable to the interest of the society’. (See: WN, IV.ix.51). Labels: Big government, Economic freedom, Practical wisdom, The good society, Why freedom?